The Energy sector is facing a new worldwide paradigm with 20 % renewables and 20 % decrease of greenhouse emission for 2020. This requires new ways of producing, storing, transporting and stabilizing electricity. 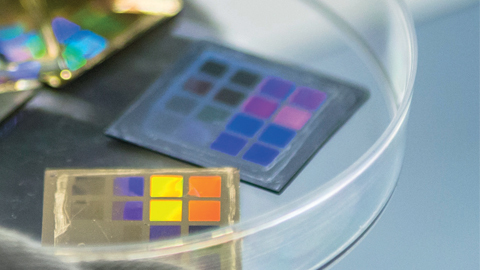 The ICMAB undertakes this challenge reinforcing our expertise in smart functional materials research and strategically developing cost-effective upscalable technologies, from materials choice all along the value chain process to proof-of-concept devices. Our roadmap promotes greener and cost-effective technologies strengthening materials growth from chemical methods and highlighting additive manufacturing technologies for large area materials at high performance/low cost. Current needs in big-data handling are demanding new solutions for the dramatic energy consumption of current computing and data storage devices. Power dissipation and miniaturization are fundamental challenges for nanoelectronic circuits. We envisage sustainable and energy-efficiency approaches to electronics by working along two fronts: exploiting dissipation-less storage and information control by electric fields and involving spin-only currents, rather than charge transport. The use of organic materials/molecules in devices will also provide important guidance towards a new-generation of memories. Great perspectives are expected for the development of devices exploiting the charge as well as the spin of the molecules. Academia and the innovative industry have directed its interests towards nanomedicine, whose technological breakthrough potentiality is widely acknowledged. It is envisaged that the unique properties of nanomaterials will make a strong impact contributing to solve some of the challenges of Health and Societal Wellbeing. FUNMAT will contribution to Nanomedecine, through improvement of drugs and medicines making them more selective, less toxic, and more efficient. It will also contribute to the advance of medical diagnosis by developing new contrast agents for medical imaging techniques. Further, the use of advanced materials and nanotechnology concepts in synergy with molecular biology will allow the generation of new tools for tissue engineering meaning a giant step for regenerative medicine.